Both of the Isle of Mull brochs, Dun Nan Gall and An Sean Chaisteal, are in spectacular locations, fairly close to the road and well worth the short walks to get to them. 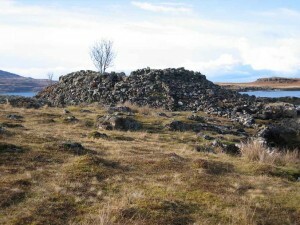 Brochs were originally thought to be defensive structures such as forts, as the word broch is derived from Lowland Scots ‘brough’, meaning fort. In the mid-19th century brochs were called ‘burgs’, after the Old Norse borg, also meaning fort. Many modern archaeologists do not believe that they were military structures, the alternative notion is that they were simply farmhouses. Just a place of refuge for the community and it’s livestock. 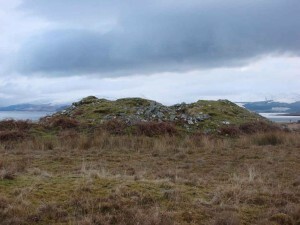 The location of the brochs on the Isle of Mull would not suggest primarily defensive or offensive functions, neither being in commanding positions. They are both easily accessed over fairly level ground. Click on any of the images to enlarge. 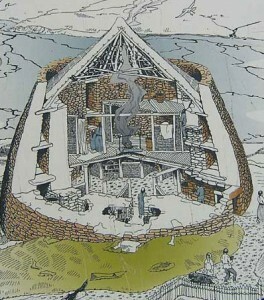 Brochs were built with two concentric walls of stone, with a stairway or gallery within the walls to the upper floors, very similar to a galleried dun. The following is edited from The Royal Commission on Ancient and Historical Monuments of Scotland, 1980, Vol. 3, Mull, Tiree, Coll & Northern Argyll. 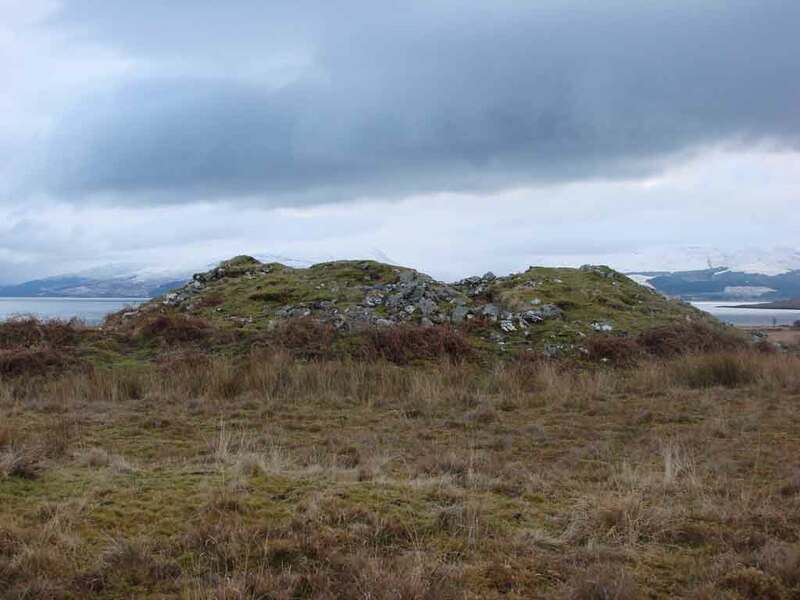 An Sean Chaisteal‘ Broch – NM 551 498 is situated 640m NNE of Ardnacross Farmhouse, overlooking the Sound of Mull. It stands on the brink of a rocky cliff 7 metres high, bordering the shoreline. From all other directions the approach is over almost level ground. The broch wall has been severely reduced and the tumbled debris now appears as a circular mound of stones about 2 metres high, with the centre slightly hollowed. However, a sufficient number of facing-stones are exposed in the surface of the mound to establish that the broch is circular on plan with a wall at least 4 metres thick enclosing a central court nearly 11 metres in diameter. 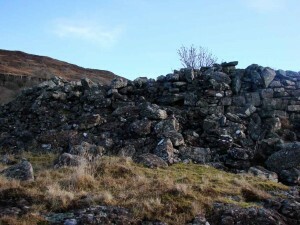 To the north of the broch is a thin scatter of stony debris, which extends to the south west along a natural scarp from the crest of the cliff. 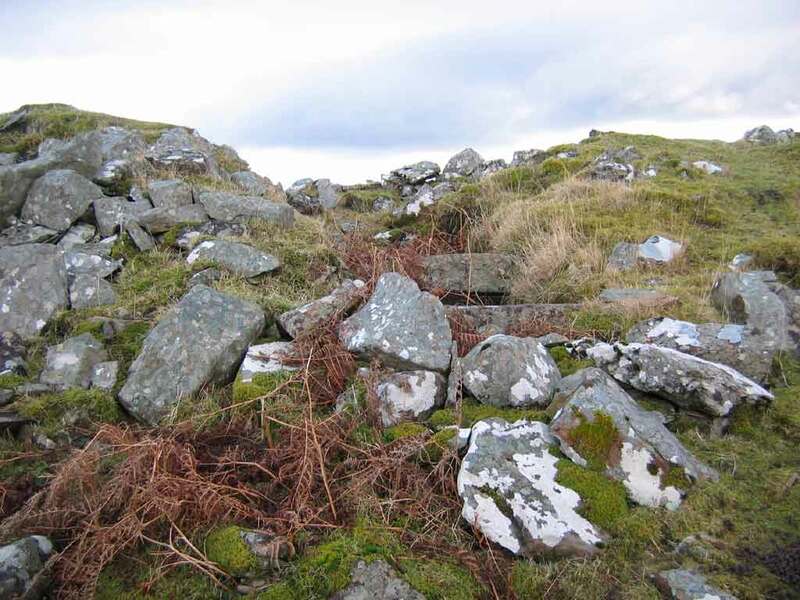 This debris appears to represent the remains of a defensive outwork, probably a wall, designed to provide extra protection for the broch entrance. what3words gives every 3m x 3m in the world a unique 3 word address. This one describes the precise location of the broch. Click here to learn more. 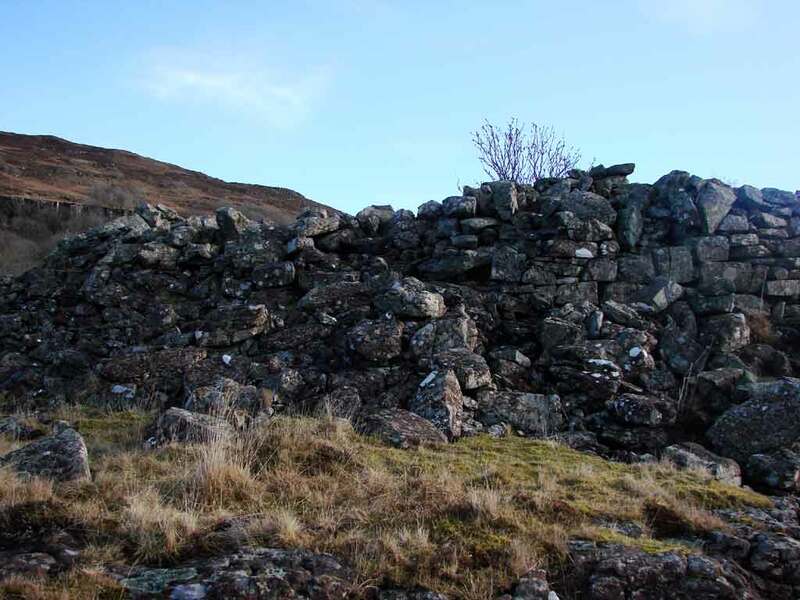 Dun nan Gall NM 433 431 is located about 700 metres west-north-west of Kilbrennan Farm. The broch is 10.4 metres in diameter within a well-built dry-stone wall which varies from 3 to 4 metres in thickness. 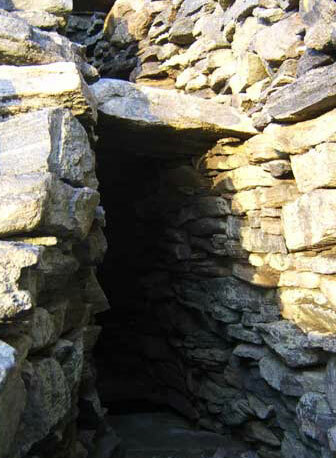 The entrance is on the east is 1.2 metres wide and on the south side there is a passage which would have opened from the interior at ground level and given access to a stair. The interior is obscured by heaps of tumbled debris which also encumbers the flanks of the knoll on all sides. 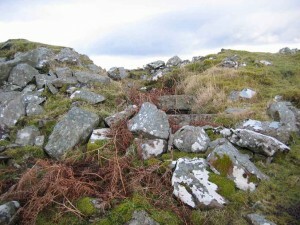 A modern dyke has been built on top of the ruins of the broch wall on the north-east.